Note: I expected this movie to be in the same vein as the 2005 version of Pride and Prejudice and the 1995 version of Sense and Sensibility. However, it wasn’t. In preparing to post the review I wrote right after watching the film, I found that Wikipedia describes the movie as “loosely based on Jane Austen’s novel of the same name…the film differs sharply from the original novel in many respects.” Had I known that going in, perhaps my expectations would have been lower and my review different. You can read my review and a general synopsis of the book here – or just Google the plot. I decided to launch Austen Month with the Austen book I know least (aka, nothing) about. 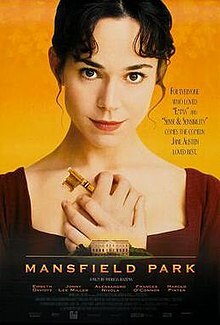 I have read all of her novels except Mansfield Park and Emma, but I’ve read an adaptation of Emma and seen parts of the movie, so I’m aware of the general plot. From Amazon: Taken from the poverty of her parents’ home in Portsmouth, Fanny Price is brought up with her rich cousins at Mansfield Park, acutely aware of her humble rank and with her cousin Edmund as her sole ally. During her uncle’s absence in Antigua, the Crawford’s arrive in the neighborhood bringing with them the glamour of London life and a reckless taste for flirtation.